Summer is the season for outdoor activity and a lot of sun exposure. People tend to go on social and family outings, sporting activities and travels in the autumn as well. In these seasons, increased outdoor activities expose the skin to strong UV rays and the heat from the sun which in turn cause pigmentary lesions such as freckles or melasma. Pigmentary lesions darken the overall facial skin tone, lending to an aged appearance. Once formed, they are not easy to get rid of, making prevention very important. Among different types of pigmentary problems, melasma is particularly difficult to treat and frequently reappears. Unfortunately, patients are driven to resort to quick-fixes which often result in treatment failure. 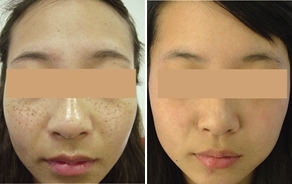 Among past experiences with various combinations of treatment for melasma, the most basic and effective mode of treatment seems to be laser toning. Various laser devices have been evaluated based on consistency of single wavelength they produce through Q-switching. Treatment with such devices may fail to bring desired effect or cause side effects such as partial hypomelanosis. 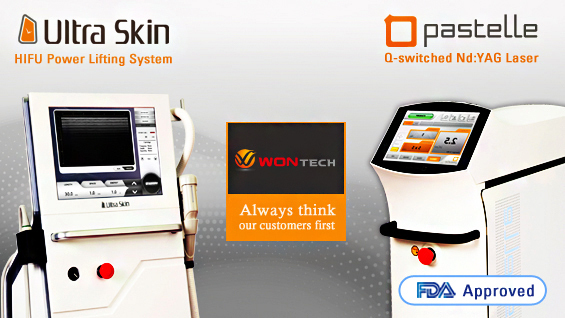 Faced with such shortcomings in treatment of melasma, I came across news that WONTECH, a respected laser manufacturer specializing in Q-switched Nd:YAG, was introducing Pastelle, a new Nd:YAG with PTP (Photoacoustic Technology Pulse). After seeing the superior effect of the Pastelle laser through various demonstrations and tests, I decided to use Pastelle to treat melasma. It was not an easy decision as there was no proof of PTP’s clinical effect on melasma removal and rejuvenation although this new laser had proven performance of previous Q-switched Nd:YAG laser of Cosjet TR. However, I came to understand that this new laser was the best choice based on the testimonials from other doctors and my past experience with using Q-switched Nd:YAG laser. In terms of beam pattern and pigmentary response (Top Hat Mode & irradiation time), the most important features of toning, the Pastelle laser allows softer beam and stability with power consistency in consecutive shots. This enables a more reliable and efficient procedure. Although the Pastelle laser may not have a dramatic effect in melasma treatment as that of other devices, the laser is softly absorbed in the pigment and the new mode of PTP offers a benefit to patients not responding to the previous Q-switched mode, which increases the patient compliance. Moreover, this new treatment has the added advantage of rarely causing common complications such as rebound melasma or hypomelanosis. Another benefit of PTP is that it only causes a warm sensation and no pain, thus making the procedure more comfortable for the patients. Perhaps the biggest benefit is the automatic calibration which adjusts various ambient temperatures, power instabilities from long-term use and long, consecutive shots, thus bringing more stability. Despite its only recent introduction, the Pastelle laser is an excellent and reliable treatment tool and I make no hesitation to recommend it to my colleagues.